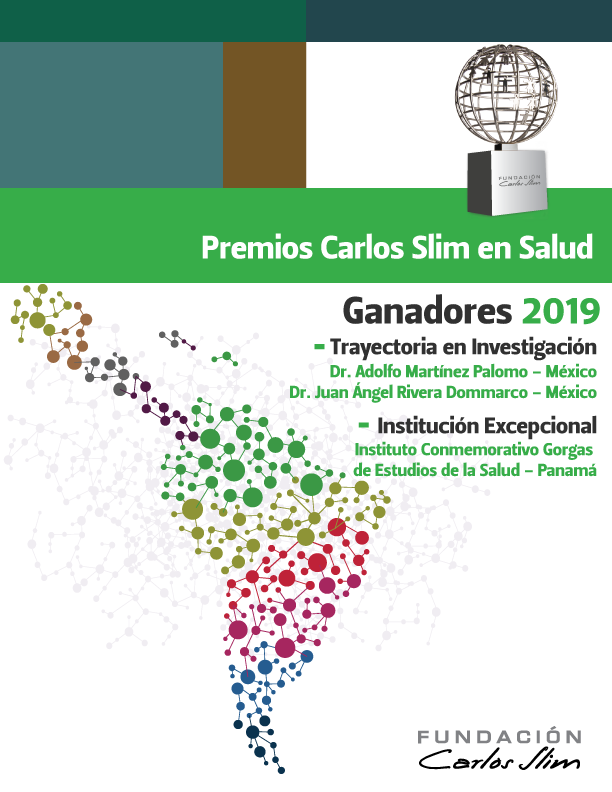 Carlos Slim Foundation congratulates the winners of the Carlos Slim Health Awards 2019, in the categories of Research Trajectory and Exceptional Institution. In this occasion, the Research Trajectory Award was given to Dr. Adolfo Martínez Palomo and Dr. Juan Ángel Rivera Dommarco, two outstanding personalities who have dedicated their lives to the benefit of public health in Mexico. The Exceptional Institution Award has been granted to the Gorgas Memorial Institute for Health Studies, for its scientific research for the benefit of the people of Latin America. He was born in Mexico City on March 15, 1941. He studied to be a surgeon at the National Autonomous University of Mexico (UNAM) from 1958 to 1964, and in 1971 he obtained a doctorate in medical sciences, also at the UNAM. He obtained a master’s degree in science from Queen’s University, in Canada. He was an associate researcher at the Institute of Cancer Research, in Villejuif, France. Among the main roles Dr. Martínez Palomo has held in Mexico, we can mention Head of the Electronic Microscopy Laboratory at the National Institute of Cardiology; director of the Mexican Program for the Study of Parasitic Diseases of the Rockefeller and MacArthur foundations; president of the Academy of Scientific Research and the National Academy of Medicine; as well as head of the Department of Experimental Pathology of the Center for Research and Advanced Studies (CINVESTAV) of the IPN, and CINVESTAV director from 1995 to 2002. He studied the biology of the neoplastic cells of the conduction system of the heart and the host-parasite interaction in amoebiasis, giardiasis and onchocerciasis. He has written five books on amoebiasis and other medical topics, and more than 150 scientific articles. He is a member of scientific committees at the National Council of Science and Technology (CONACYT), the World Health Organization (WHO), the US Academy of Sciences, the Rockefeller Foundation and Harvard University, and has been invited as a speaker in more than 20 countries. Dr. Martínez Palomo has been a member of several national, regional and international organizations dedicated to the promotion of health research, including the WHO Committee of Experts on Parasitic Diseases; the Directive Council of the International Vaccine Institute of Vaccines, founded by the UN; and the Global Health Research Committee based in Geneva. He has also been a scientific advisor to the Center for Diseases Control and Prevention, in Atlanta, USA, among other organizations and institutions. He has received numerous awards and distinctions: in Switzerland he received the Karger Prize; in Italy, the TWAS Prize; and in Mexico, the Prize of the Academy of Scientific Research, the National Science Prize, the Luis Elizondo Prize and the Eduardo Liceaga Medal. He studied a Bachelor’s Degree in Nutrition and Food Sciences at the Universidad Iberoamericana, in Mexico City (1979). Later he obtained a Master’s degree in International Nutrition focused in statistics, at the University of Cornell, New York, in the United States (1984), where he also obtained the degree of Doctor in International Nutrition with specialization in epidemiology (1988). In 1993, Dr. Rivera Dommarco received an invitation to join the then Center for Public Health Research (CISP) of the National Institute of Public Health (INSP), an institution where he has done much of his academic and work career. In August 1997, he was appointed Deputy General Director of the CISP, a position he held until August 1999. He subsequently moved to the CISP Nutrition and Health Research Area, where he developed management activities for research and teaching, in addition to directing research projects and work as professor. The strengthening of this directive position gave riseto the creation of the Center for Research in Nutrition and Health (CINyS) in February 2001, where he served as Deputy Director General. Finally, Dr. Rivera Dommarco was appointed as Director General of the INSP in 2017. Dr. Juan Rivera is a recognized researcher and academic, both nationally and internationally. He is a level-3 member of the National System of Researchers, and is Researcher in Medical Sciences for the Coordinating Commission of National Institutes of Health and High Specialty Hospitals. He has produced around 400 scientific communications, especially in the area of ​​public health and nutrition, including 228 articles in scientific journals, of which 72 have been published in level IV or higher journals. He has participated as editor or author in 56 books, and as author or co-author in 112 chapters of books and in 10 works of extensive dissemination. His published works have been cited in 17,090 occasions in various journals of national and international circulation. In addition, he has made more than 500 presentations at national and international scientific events. This institution, created 90 years ago as a tribute to Dr. William C. Gorgas, was initially administered by the United States of America; but for the last 28 years it has been under the administration of Panama. In its beginnings, the Gorgas Institute focused on scientific research on tropical diseases; currently executes a broad portfolio of research lines, which includes communicable and non-communicable diseases, studies on the health system, national surveys, development of new technologies and interventions. The Gorgas Institute is the National Reference Laboratory of Panama and offers diagnostic support and training opportunities to scientists in the region. Among the most recent achievements of the Gorgas Institite, the following stand out: detection of the re-introduction of Dengue in Panama in 1993; discovery of the cause of Hantavirus Pulmonary Syndrome in 1999; isolation of the Influenza AH1N1 virus in 2009; first report of an outbreak of equine encephalitis (E.E.) in humans with the co-existence of two viruses (Eastern E.E. and Venezuelan E.E.) in 2010; study of genetically modified mosquitoes in 2014; development of a geographic information platform for vector surveillance in 2016; and development of a new treatment for Leishmaniosis in 2017. Its mission is to lead and promote research and be a reference in public health, as well as contribute in teaching for the benefit of the population. Its vision is to be an institution of excellence in research and a reference in public health, generating knowledge to encourage health policies and interventions. The Gorgas Institute has managed to develop new technologies through a public-public or public-private international cooperation model, to complement the strengths of its scientists with the technological developments of other centers of excellence. In this way it has sought solutions to health problems that are priorities for the Latin American region, such as arbovirus transmitted by Aedes aegypti mosquito and the cutaneous Leishmaniosis. In these works the Gorgas experts have incorporated the best practices of their allies (Oxitec, IBM, Walter Reed Institute); and in turn, innovation has been focused on areas of mutual interest.